The idea was to have a tiny light come up right next to the TV after a preset period of time. If my grandpa is watching TV he would notice it and press a small button on his armchair, and the small light switches off. If grandpa is sleeping he doesn't notice the small light and so he doesn't press the small button, so after a few more seconds the unit switches the TV off. Those days TVs were not switched on and off by remote controls, but a mechanical switch that was built into the TV's front panel. So cutting the power with a relay to switch off the TV did not damage the TV. 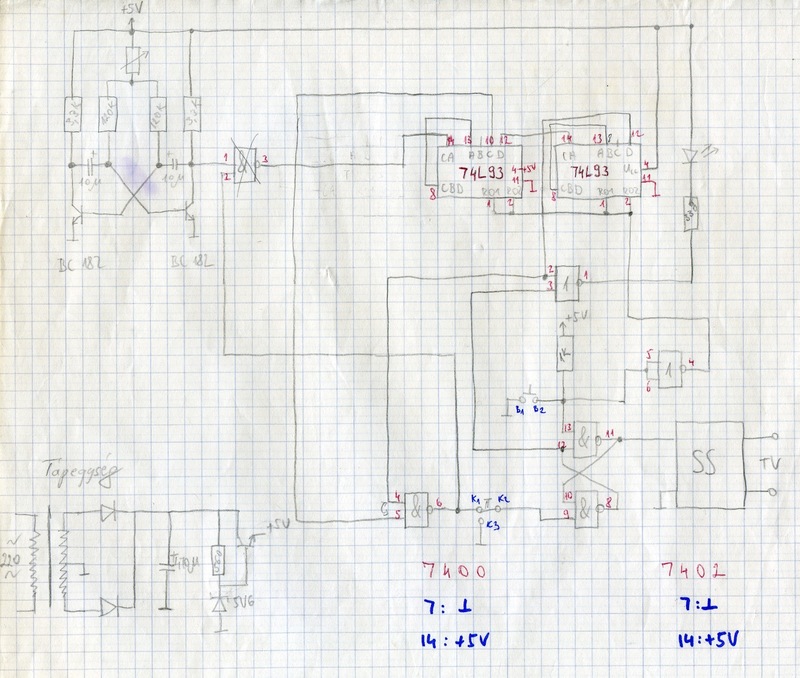 In the original circuit I used only 74xx chips, but I couldn't find these parts in Eagle, so I used the LS and HCT variations liberally :) I also replaced the solid state relay used in the original design with a standard relay. At the time, microcontrollers were not as readily available in my country as they are now. 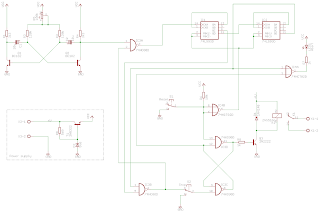 So I decided to build it with logic gates of the 74xx series. 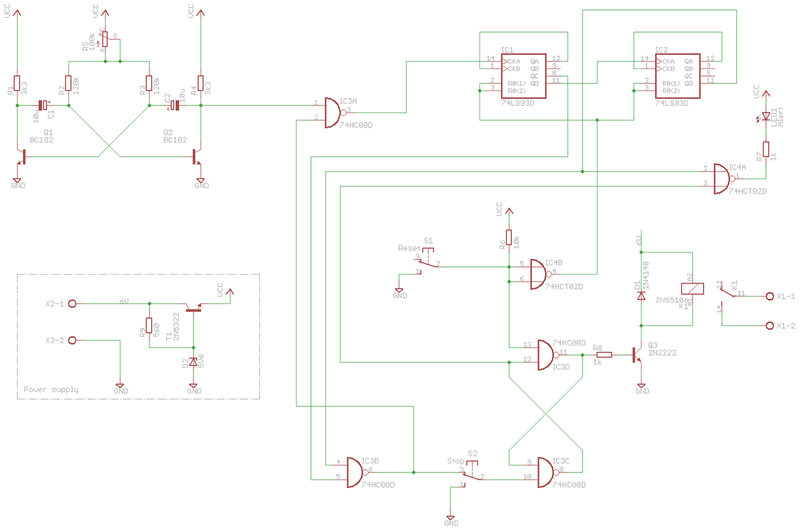 To do this I needed to make a number of shortcuts: Instead of a dedicated, high precision time base generator I simply used an astable multivibrator made up of transistors that provided some usable frequency. There is no need for a specific frequency here, because it doesn't really matter if the button needs to be pressed every 15 or 16 minutes, for example. A potentiometer can be used for "fine" tuning of the oscillator circuit. The output of the oscillator is the input of the counter/divider section. This consists of two 4-bit binary counters resulting in a maximum division of 256 and generates all the frequencies I needed for operation. Both S1 and S2 are momentary pushbuttons, their default states are shown on the schematics. Pressing S1 for a moment resets the counters, switches off the notification LED (because all the outputs of the counters are low) and switches on the TV through an SR NAND latch or flip-flop. The counting begins... When QD of IC2 becomes high it lights up the notification LED (through IC4A), but the counters keep counting... A few cycles later, when QC of IC1 becomes high, the output of IC3B becomes low which resets the flip flop, switching the TV off. If during these last few cycles grandpa notices the notification LED he pushes S1 to reset the counters and the whole story starts over. Pressing S2 simulates resets the flip flop immediately, so it is used to switch off the TV. IC3A is used to disable the timebase when the TV is off. This is necessary to avoid the blinking of the notification LED when the TV is off. For the ultimate user friendliness (remember, it's the eighties - no remotes!) I mounted the two tiny pushbuttons on grandpa's favourite TV-watching armchair. Do not use this for replicating this project, as it is not guaranteed to work. 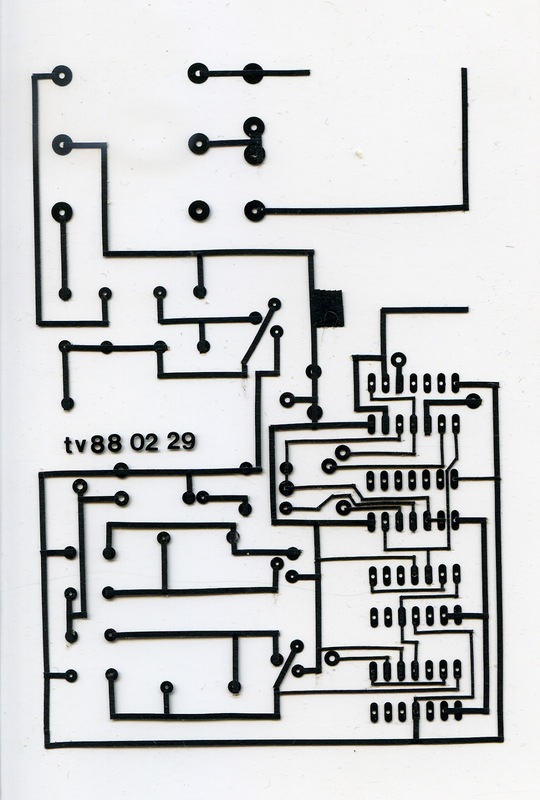 You may notice that it is slightly different from the schematics earlier. 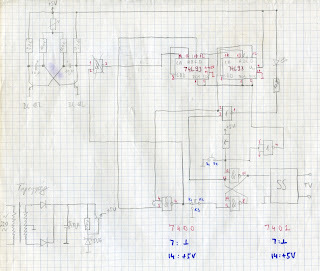 There are two reasons for this: Some parts of the schematics I modified when I wrote it up in Eagle to make it easier to understand, and some bits and pieces have been lost over the past 25 years. In fact I am surprised that after 25 years it is still almost intact. This film was then used to transfer the design to the PCB using photo transfer techniques. 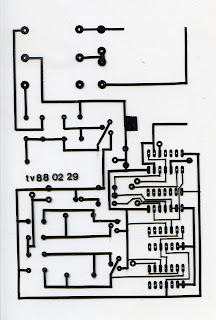 The design is for a single sided PCB with a few straight wires on the component side. All the components used at the time were through the hole as SMT parts were not easy to find at the time. This device was in use for many years by grandpa and it never failed. I also had a copy of it for my TV, just for fun. This project is suitable for beginners in electronics (like me at the time) because it does not involve programming a microcontroller and uses only very common, through-the-hole components. It also demonstrates that sometimes it is possible to cut corners in the interest of simplicity at the cost of ending up with non-standard results, in this case the timing factors. I'm not sure what this could be used for in today's world where everything is controlled by wireless remotes, has nice user interface, etc. Maybe new uses can be found for it with minor changes, like replacing the notification LED with a buzzer? If you come up with something be sure to share it in the comments. i hope grandpa didn't complain of all the extra walking !! "For the ultimate user friendliness (remember, it's the eighties - no remotes!) I mounted the two tiny pushbuttons on grandpa's favourite TV-watching armchair."